I learned how to make cream cheese dip recipes when I was very young. I did not know what cream cheese was or even chip dip. Back then we only had potato chips when we had large picnics like our family reunion. Chips certainly were not found on our pantry shelves. As far as chip dip, I do not recall seeing any at our gatherings when I was very young. We usually did not have snacks around the house. I remember when I was about eight or nine years old and my sister Donna returned home from a neighbor’s home. Donna sampled cream cheese chip dip while she was away. She was excited about how good it tasted. Of course, she also had potato chips. I do not know how but a few days later she managed to get some cream cheese and potato chips so she made the dip. It was so quick and easy! All it took was the cheese, chopped onion, salt and a little milk to make it “dipable”. It was so delicious! I quickly learned how to make cream cheese dip recipes. This still remains one of my favorite dips. It also makes a great cracker spread if left a little thicker. Remember if you are learning how to make cream cheese dip recipes, there are many different brands of cream cheese. In America cream cheese was developed while try to copy the French version of cheese, Neufchatel. This was around 1928 under the trademark of Philadelphia. It is my favorite but there are others. Most work great in dip recipes. For baking, I have found that some brands have more fat content which interferes with good results. Using cream cheese as a base, all kinds of dips can be made. Use your imagination and try adding many of your favorite ingredients. Onions, garlic, peppers, pimientos, celery and chives are just a few. Great sweetened dips can be made by adding a little flavored gelatin, mashed fruits and crushed nuts. The sweetened ones are great for dipping bagel chips, pita chips and certain crackers. These are also good for dipping whole berries and chunks of fruit. When learning how to make cream cheese dip recipes remember to let the cheese warm briefly to room temperature. The cheese will be easier to mix until perfectly smooth. Beating briefly with mixer will make it creamy and smooth. Then you can stir in remaining ingredients or beat in as you prefer. This would depend on just how smooth you want it or if you would rather it have a little more texture. After you have learned how to make cream cheese dip recipes, you may not want to serve it immediately but rather later. It always needs to be stored in the refrigerator to prevent spoiling. When refrigerated the dip will become more firm and sometimes too much for dipping chips. Most of the time after warming to room temperature it becomes softer. If necessary blend in a little milk to acquire the desired consistency. 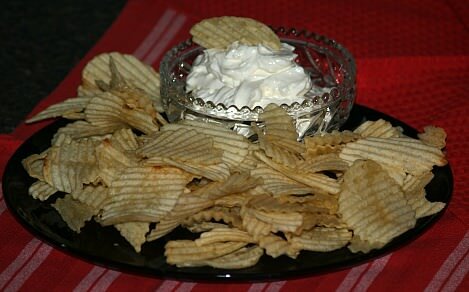 As you find how to make cream cheese dips you will come across many recipes which are hot. These are usually baked in the oven but can also be heated in the microwave. Some are even heated in a slow cooker or a fondue pot. Whatever the heat source, these are some of my favorites. Many of these recipes contain great tasting ingredients, herbs and spices. When heated these flavors are simply delicious so do not hesitate to try any of the recipes. Learn how to make cream cheese dip recipes and serve in bread. Beat first 7 ingredients until smooth; fold in onion and set aside. Cut top off rye loaf; scoop out center cutting in bite size for dipping. Dump cheese mixture into bread shell; place on platter with bread pieces to serve. COMBINE all ingredients in food processor; process JUST until blended. Cream sour cream and cream cheese; spread over bottom of 9X13 baking pan. Combine hamburger onion mixture and chili mix; stir in beans and tomatoes. Spread over the cheese mixture; spread Cheddar cheese over the top. Bake for 10 minutes; serve with tortilla chips. Heat the chili in a saucepan over medium heat for 5 minutes. 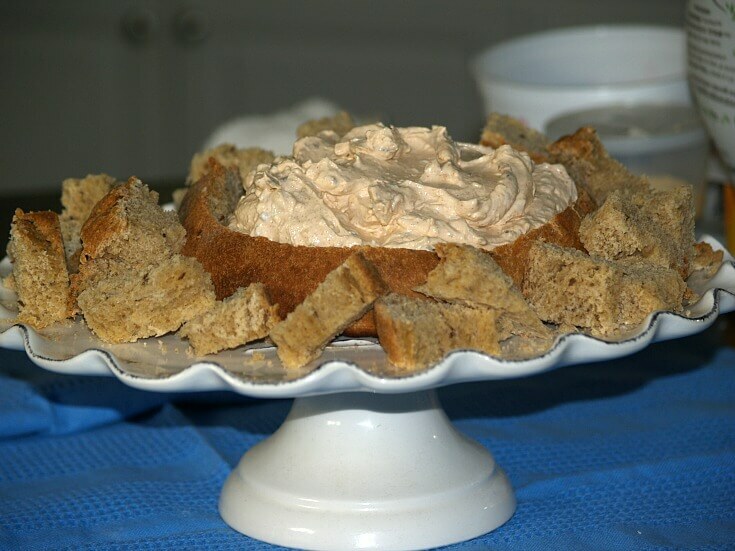 Press the softened cream cheese in the bottom of 1 ½ cup casserole baking dish. Pour hot chili over the top of cream cheese; sprinkle with grated cheese. Learn how to make cream cheese dips like this avocado recipe. Combine and blend well all ingredients EXCEPT parsley; chill. Top with parsley before serving; serve with tortilla chips. Learn how to make cream cheese dip recipes with artichokes and spinach. Combine spinach with remaining ingredients. Dump mixture into a greased casserole baking dish. Bake for 30 to 40 minutes until bubbly. Serve with butter crackers or bagel chips. 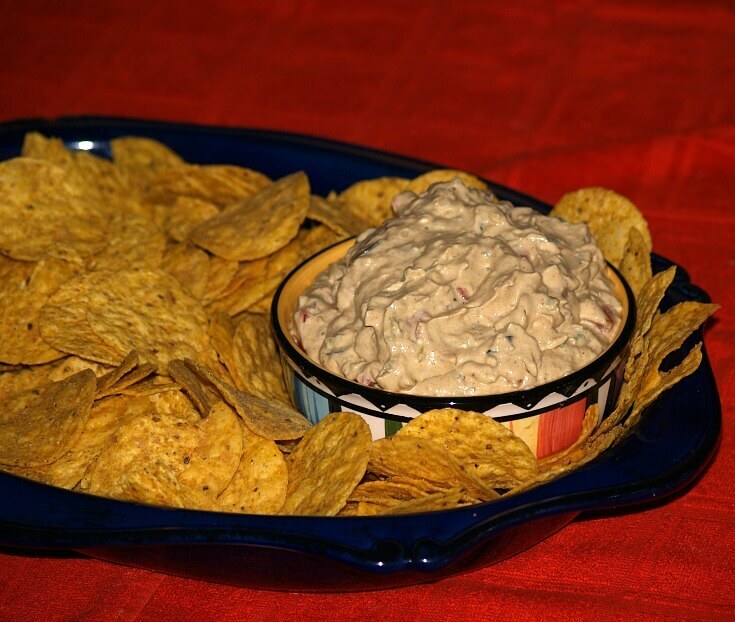 Learn how to make cream cheese dip recipes with taco flavoring. In food processor, process cream cheese and onion until smooth. Add guacamole, refried beans and taco seasoning; process to blend. STIR IN the tomato, olives, green chilies and jalapeno until blended. Season to taste with salt and pepper; serve cold with tortilla chips. ½ cup of the Parmesan cheese; set aside for topping. Drain and chop asparagus in large bowl. Add cream cheese, mayonnaise, 1 ½ cups of the grated cheese and garlic. Blend mixture until well blended; season with salt and pepper. Remove from oven; sprinkle with reserved ½ cup Parmesan cheese. Serve hot with toasted bread chips. NOTE: This recipe is best if made in an electric pot so it can be kept warm throughout serving. Combine all ingredients except wine in pan. Stir over low heat until cheese melts. Add wine and serve hot; serve with potato chips or bread dippers. Learn how to make cream cheese dips for serving with vegetables. In mixing bowl beat Roquefort cheese and cream cheese until smooth. Add remaining ingredients and beat well; chill for at least 2 hours. Serve with carrot and celery sticks and other veggies. Learn how to make cream cheese dip recipes with salmon. Combine all ingredients except parsley in a mixing bowl; beat until smooth. Sprinkle with parsley and serve with bread chips, crackers, bagel chips etc. Learn how to make cream cheese dip with Asian flair. Combine cream cheese, mayonnaise and soy in mixing bowl. Beat mixture until well blended and smooth. Add shrimp, water chestnuts and green onions to the cheese mixture. Blend mixture well; serve with crackers. Learn how to make cream cheese dip recipes like one from my home. NOTE: After browning sausage combining in a slow cooker works well to keep the dip warm. Brown sausage in skillet; drain off excess drippings. Over low heat melt cream cheese and Velveeta in pot with milk stirring constantly. Add to the pot pimiento, Tabasco sauce and cooked sausage. Cook over low JUST until well heated (Not bubbly) stirring occasionally. Learn how to make cream cheese dip recipes with vegetables. Combine corn, tomato, pepper, onion, jalapeno and lemon pepper. Refrigerate vegetables for 1 hour or longer to chill. Add cold vegetables to the creamed mixture; stir to blend well. Season dip with salt and pepper; serve with wheat crackers or tortilla dippers. Learn how to make cream cheese dip for fruit; especially good with pears. In a small mixing bowl beat together the cream cheese, honey, lemon juice and ginger. Stir in the blue cheese until blended; cover and refrigerate 1 to 2 hours. Serve with fresh sliced fruit; makes 1 ½ cups. Learn how to make cream cheese dip recipes with cranberries. In a small mixing bowl beat together the cream cheese, corn syrup and sugar until fluffy. Blend in the sour cream; fold in cranberries and orange peel. Refrigerate until serving; serve with fruit pieces or shortbread cookies. Learn how to make cream cheese dip recipes flavored with beef and pecans. In mixing bowl combine first 8 ingredients and mix well; set aside. Sauté the pecans lightly in melted butter; blend into the bowl mixture. Pour mixture into a shallow baking dish; bake 20 minutes. Learn how to make cream cheese dip recipes with amazing flavor. Combine first 5 ingredients in mixing bowl; beat until smooth. Stir in the onion and radishes; serve with chips or crackers. Combine cream cheese, mayonnaise, Swiss and onion; spread in 9 inch microwave dish. MICROWAVE on high 4 minutes; spread with bacon and serve with pita chips. Preheat oven at 375F degrees. Cream cheese and milk; add remaining ingredients and blend. Spoon into baking dish and top with almonds; bake 15 minutes and serve.